Oktoberfest at a Pub near you! 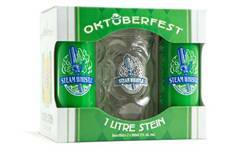 Hundreds of bars & restaurants throughout Ontario, Alberta & BC will be offering the Steam Whistle Oktoberfest steins from late August through October. 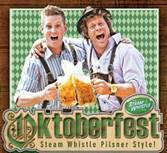 Order a litre stein of Steam Whistle Pilsner and keep the Stein! Some bars will have a ‘Refill the Stein’ option. Ask your server for details. Visit http://www.steamwhistle.ca/locator/locator.php for a listing of all the locations featuring the KEEP THE STEIN promotion, while quantities last. Bring a little Oom-pah-pah home with this gift pack that includes 2 x 500ml cans of Steam Whistle’s authentic Bohemian Pilsner ready to pour into your own 1 litre Oktoberfest stein decorated with an old- school pewter medallion. Gift packs are $14.95 at 150+ LCBO stores across Ontario during September & October, while quantities last. To find locations visit www.lcbo.com and search CSPC#292862.